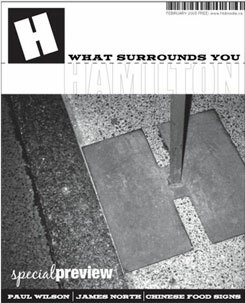 Welcome to the very first attempts at H. This is a special preview issue of what I hope will become a bi-monthly publication that covers Hamilton�s urban landscape. There�s a gritty elegance to living in place that has steel mills engulfing the waterfront, expressways speeding through valleys and a down-and-out downtown core that is waiting to shine again. As much as I wish that Hamilton had all it�s ducks in a row, I can honestly say that this magazine wouldn�t be as interesting for me to create if everything was picture-perfect. I would like �H� to be a combination of Hamilton�s urban stories, architecture, design and history � essentially �H� will be what is around us, the buildings we�ve forgotten about, found art on the sidewalks and the little details that we don�t look up to see. Our relationship to the cityscape is something that is grossly overlooked and underrated in Hamilton. This is a very cool place to live. Who cares if anyone else knows it! Before I leave you to wander the streets of H, just a few public service announcements. We�re currently looking for writers, artists & photographers who�d like to share their knowledge & vision of Hamilton with others. As you�ll notice, with a few notable exceptions, this has pretty much been a one-man factory working lots of overtime and running way behind in production. So I�d definitely welcome some outside observations, opinions, snapshots, etc. We�re also looking for some cool advertisers to fill in some space and help pay some bills. If you want details on either, email me at htdmedia@gmail.com and I�ll fill you in. One last thing, we hope to have the real first issue of H out in March but we may not be able to give you well enough notice to attend this great event. Environment Hamilton presents a free public forum with Pierre Filion on Wednesday, March 9th, 7 pm at Hamilton Central Library. The topic is The Successful and Unsuccessful Downtowns of Mid-Size Cities. Dr. Filion is the author of numerous articles on downtown and inner city planning and I�m sure he�ll have lots to say about Hamilton. Many thanks to my wonderful wife, Ter�sa for supporting me in this huge project and for walking the James North walk with me that you can all read about on Page 7. Thanks also to Special Collections at the Hamilton Public Library, the Archives of Ontario and everyone who has made a contribution to this special preview issue of H. OK, I am done for now. Go out and spread the good word of Hamilton and make something happen.